How Do You Know If You Need Your Sewer Drain Repaired or Replaced? We can diagnose any of these issues and offer solutions to get y our drains working properly. What Are the Drain Replacement Methods? You have a few options for replacing your drains in Toronto and our free inspection will help determine which of these is best for your situation. Traditional Repair: This involves digging a trench to access the drain pipes. This may require using a backhoe to dig out and then refill the area when repairs are complete. The main advantage to this method is it allows us to see first hand the issue and make repairs. 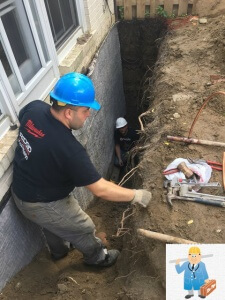 Trenchless Repair: This is much less disruptive to your property and requires us to dig a hole at either end of the damaged pipe, rather than exposing its entire length with a trench. Pipe Bursting: This allows us to guide new pipe through the old, damaged pipe, bursting the old pipe out of the way as it is replaced with the new drain system. This is effective on many kinds of pipe including PVC, iron, clay, terracotta, and concrete. Pipe Relining: Little digging is required for this method that creates a “pipe within a pipe.” This method can repair holes, seal cracks, and even repair pipes damaged by roots and rust. Time: Traditional drain repair can take days to complete during which time your home can be thrown into turmoil. Trenchless plumbing is usually able to be finished in a single day. The most time-consuming aspects are actually the video inspection of the pipe and the small holes that need to be dug on either end. Quality: Trenchless repair uses seamless pipes that are joint free so you’re less likely to have problems in the future than if you use traditional pipes. The pipes are made from a material called HDPE which is extremely resilient and will likely last for decades to come. Function: The seamless pipes used in trenchless repair require less maintenance than traditional pipes and may also lead to improved flow capacity. Though every case is different, the sooner you take care of a damaged drain, the fewer problems you’ll have down the road. Trenchless drain replacement is a more cost-effective option than traditional repair and will always save money in the long run. What Can You Expect Choosing Us for the Repairs? We treat your home the way we expect workers to treat our homes. That means coordinating with you from the moment you call for a quote all the way through the final work we perform. Our team will cover and clean everything in their work area so you don’t have the added stress of a mess to tidy up and we’ll finish as quickly and efficiently as possible. We can also help with insurance and obtaining any permits or the potentially valuable, cost-reducing City of Toronto rebates you may qualify for when you hire a licensed and insured company like Dr. Pipe to do any drain work that may be necessary for your repairs.